Shandong released the top 30 cultural enterprises during the 7th Shandong Cultural Industries Fair held in Jinan from October 11 to 15. In the meantime, the 3rd Awarding Ceremony for Advanced Counties and Cities in Cultural Construction and the Signing Ceremony of Key Cultural Industry Projects were held in Jinan International Exhibition and Convention Center. 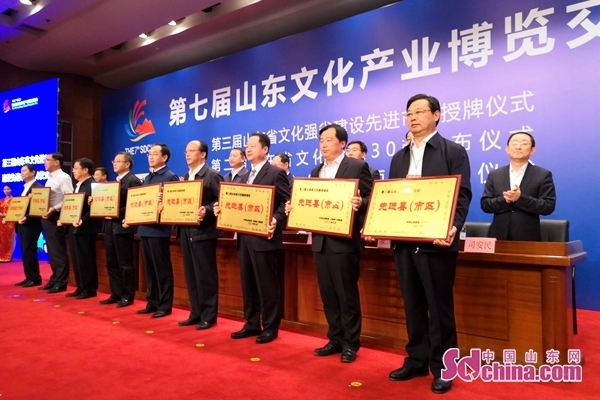 According to the list released by Shandong provincial government in June, 9 cities including the capital city Jinan and 69 counties (towns and districts) including Lixia District of Jinan received the award at the ceremony. The top 30 cultural enterprises of Shandong were revealed yesterday, inclusive of Shandong Press Group Co. Ltd., Shandong Film and Television Production Incorporated Company, Shandong Haikan Internet Tech Co. Ltd., Qilu Media Group Co. Ltd., Shandong Internet Media Group Incorporated Company, and so on. 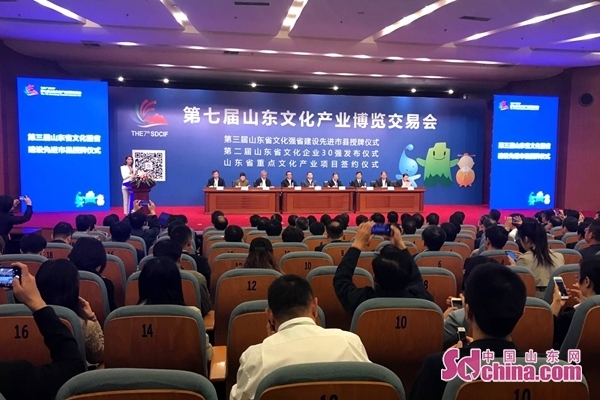 Six key cultural industry projects were signed at the ceremony, with an investment of 121.68 billion yuan and a financing amount of 8.5 billion yuan. This marks the new achievements in the transformation and upgrading of cultural industries, and the integrated development of technology, finance, tourism and trade.